Heeft u een vraag voor Rampura Kothi-Bed and Breakfast? Ontworpen voor zowel zakelijke reizigers als toeristen, is het Rampura Kothi-Bed and Breakfast ideaal gelegen in Vaishali Nagar gebied; één van de meest populaire buurten van de stad. Op slechts 4.00 Km gelegen vanaf het stadscentrum en 15.00 Km van het vliegveld, trekt dit 1-sterren hotel jaarlijks vele reizigers. Dankzij de praktische locatie liggen alle belangrijke trekpleisters in de buurt van het hotel. Het Rampura Kothi-Bed and Breakfast biedt tevens vele faciliteiten om uw verblijf in Jaipur zo aangenaam mogelijk te maken. Parkeerplaats, roomservice, familiekamer, tours, wasserij zijn slechts enkele van de faciliteiten waarmee het Rampura Kothi-Bed and Breakfast zich onderscheidt van andere hotels in stad. 04 kamers, verspreid over 02 verdiepingen, bieden een warme en plezierige atmosfeer met modern comfort zoals handdoeken, plasma tv, spiegel, rookvrije kamers, airconditioning. Het hotel biedt een uitstekende variëteit aan recreatieve faciliteiten, inclusief tuin. Het Rampura Kothi-Bed and Breakfast is een ideale verblijfsplaats voor reizigers die charme, comfort en gemak zoeken in Jaipur. The building is situated in a great neighborhood, the room was generous and it was great to enjoy the sun from the large terrace. The staff was great, they even allowed us to do the check in earlier and wash our stuff. They helped us finding a great driver for a one day trip and when we picked up our baggage, later after our check out, we even phoned for a last goodbye. We have left with a wonderful feeling. Quiet location, wich is rare in India, so that's a plus. Nice staff, very helpfull. The bed is comfortable, the room in big. The lavatory could need a little more cleaning but nothing to bad. The only problem is there are only a few restaurants around, and all are quite expensive. Over all a great stay, would recommend and go again. Fantastic friendly service. The owner made us feel so welcome and at home and was so helpful. He booked ubers for us and gave great suggestions of things to do. The location was safe and very handy. Thank you for a great stay!! This house is beautiful, way convenient, spacious rooms, squeaky clean, and equipped with all the facilities we need like hot water, wifi, and breakfast. It is located away from the bustling city (just what we needed) but no worries, it is easily accessible from town. Shakti, the house owner is very polite and always there to assist us by preparing meals, booking tuk tuk, taxis and he even drove us to show the places around. He went extra mile by sending a tuk tuk to fetch us when we arrived at the train station at 3AM. Even at that time, check in was smooth. He even recommended few eateries for us to try, and Handi was our favourite. Value for money with huge portion. Overall, our stay and experience here exceeded our expectations in many ways. We will absolutely return here when we visit Jaipur! Thanks Shakti! In a nice calm neighborhood... Nice house, spacious an well equipped rooms. Terrace to relax, quiet. Nice host too (son of the family). Rampura Kothi is one of the best places where I stayed during my trips. The service is absolutely exceptional, the room extremely clean, delicious breakfast. You have a lovely terrace, and many good standing restaurants are located nearby. Shakti is a wonderful host, he took us by car to show us the restaurants and gave us many advices. I will definitely recommend Rampura Kothi. Rampura Kothi is just like home for us at India, it made us feel secure and cordial. The owner is a very kind & generous person we ever met in India, he knew everything we need and provided useful information. This stay experience is worth more than it's cost. We will still choose here if we came to Jaipur again! This place really got everything right. The room was much nicer that the pictures showed. Super clean and tastefully decorated. If you need a place to recharge in chaotic Jaipur, this is the spot! The host was super friendly and the breakfast tastefull. An Uber taxi can take you everywhere in Jaipur from here within minutes! Our host Shakti Singh is the nicest, most helpful we have had in all our travels. He has a wonderful home and did more than one would reasonably expect to make our stay comfortable. 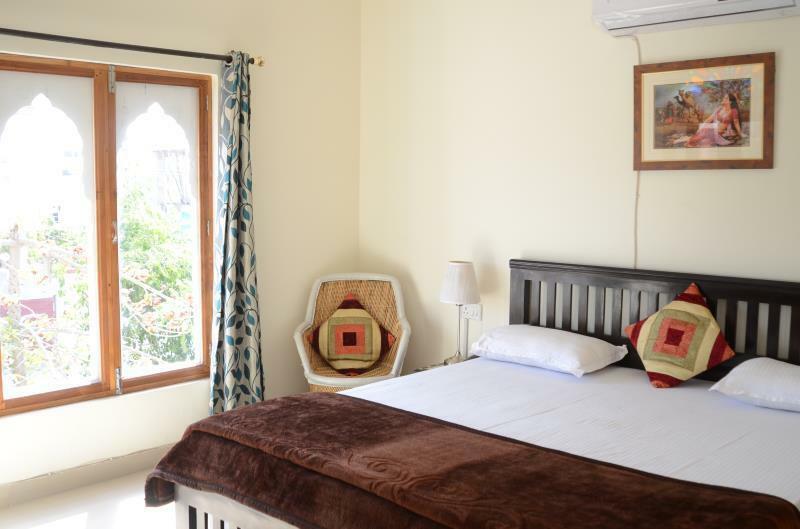 The rooms are well equipped and comfortable and set in a quiet location. He went out of his way to take us in his own car and always had our best interests at heart. Top Tip. Let Shakti get you registered with Ola cabs it's the best way to get around. personal touch by the owner.. It was good n comfortable.. The owner shakti helped us in every possible way..
We spent 3 nights in a lovely guest house , in a quite and pretty neighborhood away from all the fuss. The room was spacious and clean, with clean white linen and towels. The bathroom was big and clean, with plenty of hot water. The breakfast was fresh and delicious. And the most important was the hospitality of Shakti, the owner of the guest house. shakti did everything to make us feel comfortable. He ordered taxis for us, advised us about site seeing, restaurants etc. it seemed like he really cared about us enjoying our stay in india, and we were touched by his generous hospitality. We recommend this place with all of our hearts. C'est un guest house familiale chaleureux, les chambres sont propres. Le gérant est serviable. Il nous a proposé plusieurs fois de nous véhiculer au centre ville et à la gare ferroviaire. Le petit-déjeuner est basique mais suffisant pour bien démarrer la journée.